Los Alcazares holidays take you to the salt water lagoon, Mar Menor, on Spain's Costa Calida. It is a spa resort where the waters are said to have healing properties. Holidays to Los Alcazares can be taken at any time of year as the summers are long and hot and the winters are mild. April to October are the busiest times, with temperatures rising to the low thirties at the height of the season. 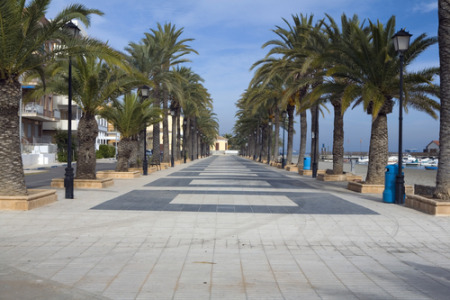 Holidays in Loa Alcazares have wide appeal as there is much to see and do. With good sandy beaches and very safe waters for weak swimmers, it comes as no surprise that our cheap Los Alcazares holidays are snapped up by families. They are considered great value as our commitment to quality and service are never compromised. Our low cost Los Alcazares holidays can be as relaxed or as active as you wish. Water sports abound and the waters are particularly good for diving and snorkelling. Golfers have a choice of courses in the area. To make the most of your stay here, car hire is advised. Restaurants cater for all tastes and shops, though limited provide for all your holiday needs. With one or two lively venues, nightlife nevertheless remains low key. If you are looking for a guarantee of summer sun in a pleasant, relaxed resort, choose one of our last minute Los Alcazares holidays and you will not be disappointed. For further details, and to view our best Los Alcazares holidays, please use the search facility.